Cuff links are tricky things. Hard to get right, but the best form of jewellery when you do. My problems with most modern cufflinks led to me designing my own range with jeweller Diana Maynard last year. Those sold well through this blog but did even better on The Hanger Project, Kirby Allison’s website that has grown from a supplier of luxury hangers to something far bigger and broader. 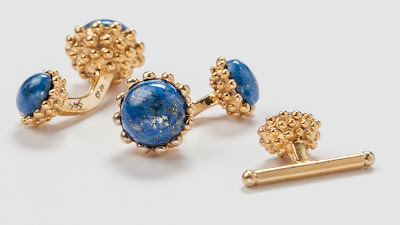 Kirby was spurred by that success to try and find a great jeweller of his own on the other side of the pond, and the result is the beautiful gold and lapis lazuli pair shown above. Referred to as the Golden Acorn design, these are step up on my links in both quality and price. They are made in sold 14kt gold (approx weight of 15 grammes) and are available to order by next Wednesday, the 25th, for $2250 (50% deposit upon order). But they retain a lot of the design aspects that Kirby and I agree on. They have a substantial form on both side of the cuff, measuring the same 10mm across on the front as mine, and come with a relatively short shank that will ensure they don’t swing around too much and bang on the desk. Also interesting is the design for the matching studs, which have a retracting bar allowing them to be easily inserted into a shirt but highly unlikely to ever fall out, once the bar has retracted. Kirby has far more details on his intention behind the project and the technical specs here. As they are all made to order, some changes to design are possible, such as requests to have them made in white gold. Permanent Style readers can get free express shipping by quoting the code PSTYLE either on the order form or over the phone. 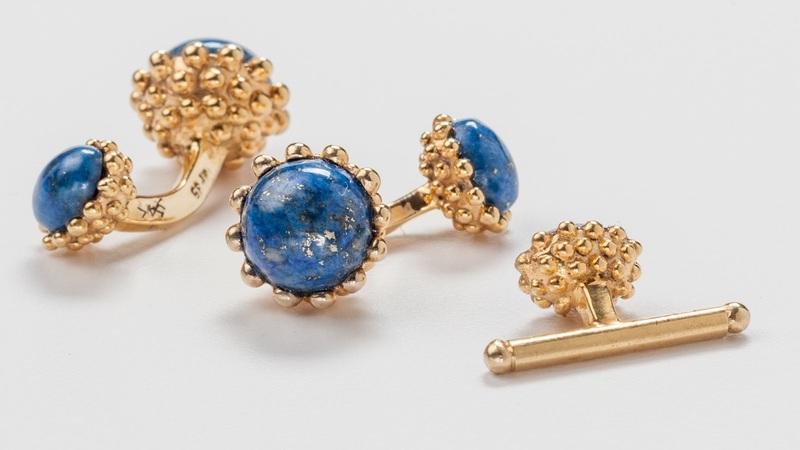 You can follow the discussion on Golden Acorn cufflinks by entering your email address in the box below. You will then receive an email every time a new comment is added. These will also contain a link to a page where you can stop the alerts, and remove all of your related data from the site. This cufflinks are looking amazing.I think these cufflinks are so expensive. If you actually buy a cufflinks try to search the internet.You are scout for different price so you can be sure that you can get the more value for your money.And dont forget to buy a cufflinks box for these beautiful cufflinks..
What is your opinion on the silk barbell style cufflinks that you can pick up cheaply from places like the Jermyn St. shirt makers such as TM Lewin, Charles Tyrwhitt, etc? I quite like them as they maintain a tight cuff, add a bit of colour, don’t make any clang or bang when hitting the desk, are light and don’t feel too pretentious. Do you consider them to be cheap and vile and I should go back to school?